My normal restaurant choice for lunch is something cheap and simple... there are several choices close to where I work in Karon Beach such as Mama Noi, or a great Phad Thai shop, or several small local places. 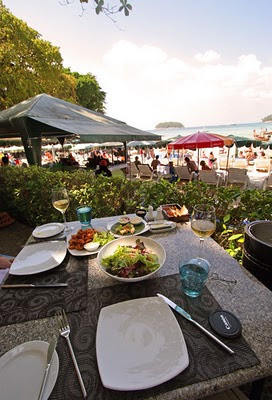 But a couple of weeks ago I was invited for a business lunch at Mom Tri's Oasis at Kata Beach. 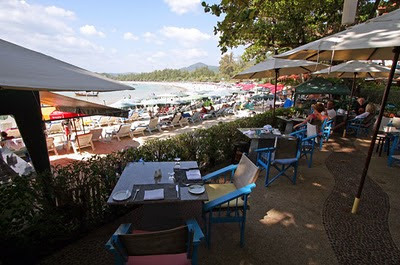 I have eaten before at Mom Tri's Kitchen which is overlooking Kata Noi Beach, so hoped for similarly delicious food. 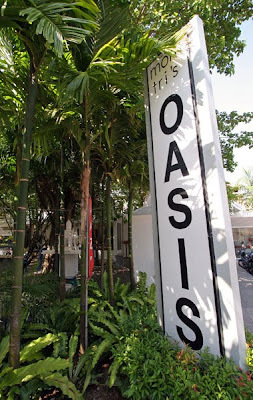 The Oasis restaurant really is right on Kata Beach. There were sunloungers just a couple of meters away.... felt a bit odd... I was told that the restaurant is much nicer in the evening when the beach is empty.. there were not many diners on the day I was there.. guess we'll have to go back in the evening one day when I am feeling rich. Yeh, it's not really expensive - I am sure plenty of people would say that the prices are very reasonable considering the quality, the location, the service..